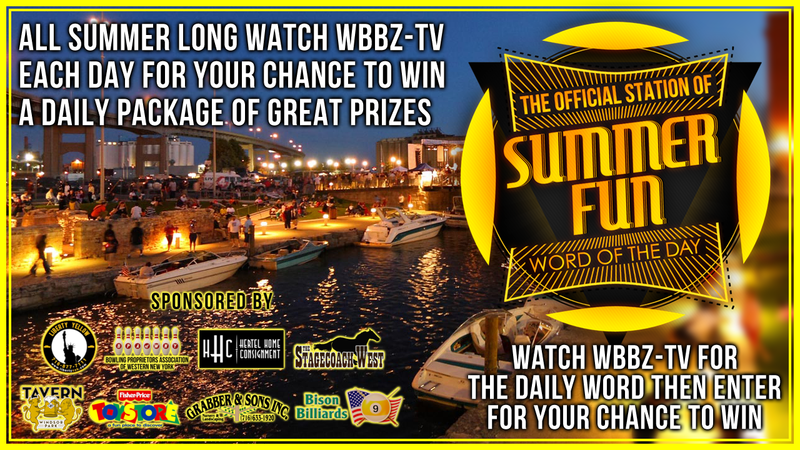 Enter to win the OFFICIAL STATION OF SUMMER FUN PRIZE PACKAGE from WBBZ-TV, Your Hometown Summer of MeTV Station, and our hometown summer fun sponsors! Then, here at www.wbbz.tv, submit your name, the information requested, and the correct “Summer Fun” word in the form below. One entry per person, per family, per day. Contestants must be 18 years of age or older to win. A daily winner will be selected daily at random from correct entries received, and posted on the WBBZ-TV Facebook page, @WBBZ on Twitter, and the station website. WBBZ-TV, and associated sponsors, are not responsible for any liability associated with the receipt and use of any of these prizes. Winners will officially be notified, with their prizes delivered, via US Mail. No prizes can be exchanged for their cash value. Void where prohibited. Employees of WBBZ-TV, and our affiliated sponsors are not eligible. Contestants from the viewing area served by WBBZ-TV over-the-air, and on our carrier partners, are eligible to enter to win. Summer Fun Clue Words will only appear on-air, and will not be posted online. Calls to the station asking for the “Word” will not be acknowledged, as the viewer needs to watch to secure the clue. All entries are time and date stamped when submitted.